The problem the cell faces is that DNA cannot leave the nucleus. The nucleus is like a big fireproof blanket that protects the DNA. Outside the nucleus, in the cytoplasm of the cell, there are too many molecules that could damage the DNA. So the cell had to evolve another way to get the DNA code out of the cell and make it into the proteins necessary for life. It’s truly art. (The process, I mean. Though, that picture is pretty nice…) Imagine your DNA ladder in the nucleus of a cell. A protein called DNA helicase comes in and unzips the ladder, disassociating the complementary nucleotides from each other. This creates a space for another protein, RNA polymerase, to access just one strand of the DNA. RNA, or ribonucleic acid, is similar to DNA. It is made up of nucleotides, and RNA polymerase uses the single strand of DNA as a template to build its own complementary strand. (If you want to get technical, it actually uses all the same complementary nucleotides as DNA, except for uracil replaces thymine to bind with adenine.) RNA polymerase uses the start and stop codons, as well as “known” (can RNA know something?) sequences called promoters located before a gene and encoded in the DNA, to locate the one gene it needs to create its protein of choice. It copies just the short strand it needs before hustling out of the nucleus. But it has to go through a border checkpoint to leave! The RNA has a special cap on the end of its strand, so that the “guards” in the nuclear membrane know it is allowed to leave. A passport, if you will. Once it leaves the nucleus, it heads to the ribosome, which is an organelle in the cytoplasm that builds proteins. 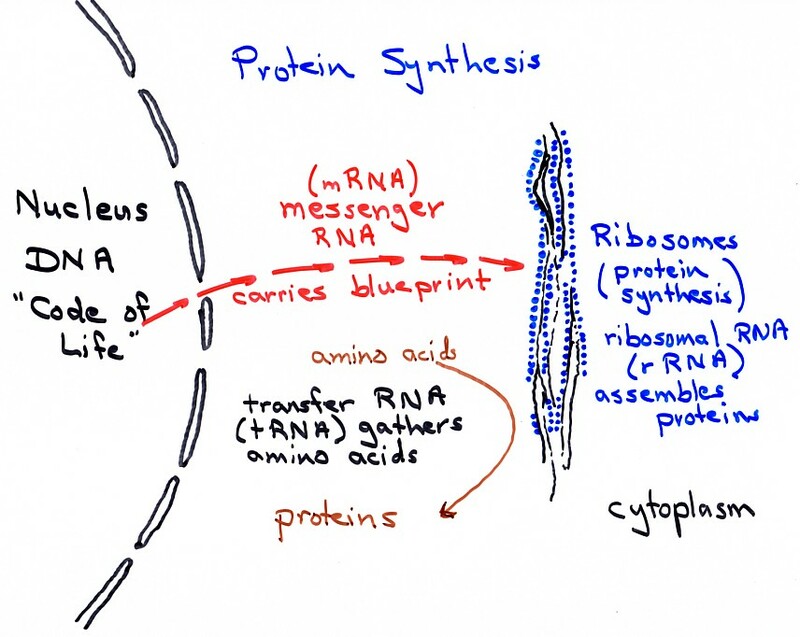 In the ribosome, the RNA is read codon by codon, and the coded amino acids are assembled one by one in a line. When the whole sequence is read and the amino acids assembled, the protein folds up into its specific shape. For more information, check youtube. Really. It’s amazing to watch videos of molecular processes — makes your insides seem truly alien. Click here for a basic video that goes through what I’ve described above. DNA and RNA look like tinker toys! If you have a spare 15 minutes, PLEASE watch Protein Synthesis: an epic on the cellular level. It was filmed in 1971 at Stanford University and portrays drunk partying science students acting out protein synthesis in a huge field. It’s pretty awesome. Wish I were there. Hi, I’d just like to say your protein synthesis diagram was extremely helpful to my biology assignment and I’d like to thank you.